Rare Aircraft – Mad Men: An Unusual Cessna 206 | Achtung, Skyhawk! As much as the art of marketing can be frustrating to those on the receiving end, its nuances, quirks – and not least of all its failures – rarely fail to add an interesting back story to the product it is trying to promote. 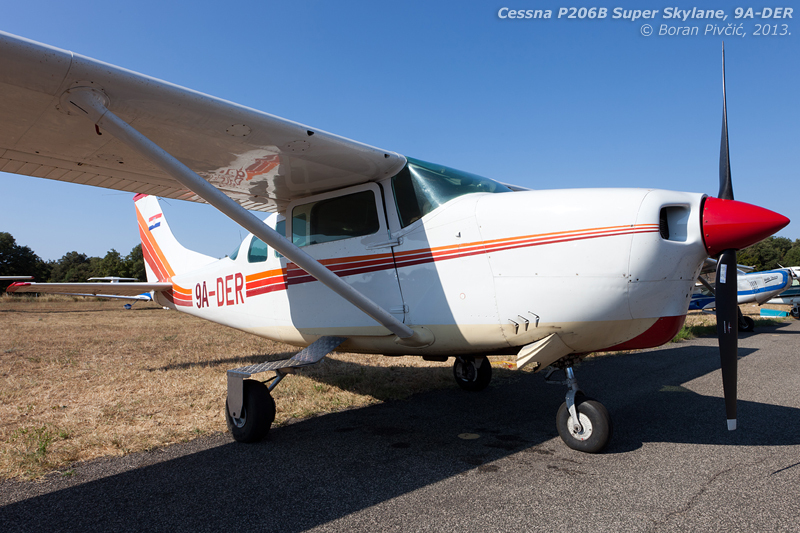 Among the many fascinating examples out there is that of a Cessna 206 I’d come across at Vrsar Airfield (LDPV), an aircraft with a story so complicated it makes the whole airplane all that more interesting – though likely not in the manner that Cessna’s PR men had envisioned :D.
Its story thus begins not with a blank piece of paper, but the model 210 Centurion, Cessna’s posh high-performance tourer. First flown in 1957, the original 210 was quite unlike the luxury model that it is today, having started out in life as just a high-performance version of the model 182 Skylane. Based on the fuselage of the early 182 models, the 210 had included new tail surfaces and wings (strutted, its famous cantilever design still a decade away), a more powerful 260 HP engine – and, most importantly, retractable landing gear. Pretty hard to tell apart from a regular 182 at a distance, this first 210 would remain in production until 1960, when it would be replaced by the upgraded 210A, which featured a wider and longer fuselage with space for six instead of the 182’s four. However, with the model number still alluding to the expensive and exclusive Centurion, Cessna’s PR team had had another rethink, eventually renaming the new aircraft into the model 205. To dilute its “posh” heritage even further, this model would also become known as the Super Skylane, hopefully leading buyers to believe it was just a Skylane with two extra seats 🙂 (Cessna would pull the same trick off once more in the late 60s, marketing the 210 HP Reims Rocket, the 195 HP Hawk XP and the retractable Cutlass as 172s rather than the more expensive and troublesome 175 Skylark on which they were actually based). Nowadays a very rare bird – I myself know of only one example in the region – the 205 was produced for only two years, being dropped in 1964 in favor of the upgraded 206 :). On the surface at least there seemed to be little in it between them. The same size and with the same passenger capacity, the 206 seemed to be more of the same from the marketing squad – but was in fact a clever re-think of the design, one that would have quite an impact on today’s 206 family. Under the skin, the most obvious change was an increase in power, up from the 260 HP of the 205’s Continental IO-470 to a juicier 285 HP of the 206’s larger and torque-ier IO-520. The other important detail was the diversification of the 206 line into several sub-versions, each with a different role. The most famous of these (and the only one to survive till today) was the U206 – U for “utility” – which would be the first model to feature the type’s distinctive split rear cargo doors, designed for ease of loading and unloading of cargo far, far in the backwoods :). A version more pertinent to this article was the P206, with P standing not for “pressurized” but “passenger” (an eyebrow-raising moment this 😀 ). This version retained the door arrangement of the 210A, 210-5 and 205; namely, two large passenger doors on either side of the front cabin. The only Cessna model to ever use P for anything other than pressurized, the P206 was relatively short lived, produced only between 1965 and 1970 in a slew of versions (up to the P206E), including even a turbocharged model called the TP206 :). Like the 205, it had retained the Super Skylane moniker, in line with its sales image as a six-seat 182. Pingback: Photo Report – Going Up: Cessna U206G 9A-ADV | Achtung, Skyhawk! Pingback: Photo File – The Heat Is On | Achtung, Skyhawk!